Morrow Park, newly acquired by Tyndale University College. In a bold $40 million deal, Tyndale University College & Seminary – which was struggling financially only a few years ago – has purchased the nearby 56 acre Morrow Park from the Catholic Sisters of St. Joseph. This is the largest acquisition in Canadian evangelical history. The property, located on Bayview Avenue in Toronto, is currently home to St. Joseph’s Morrow Park High School. 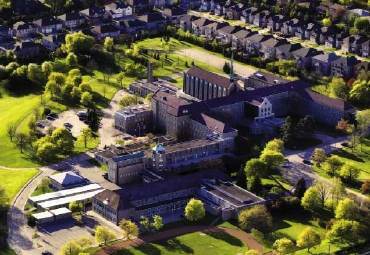 Tyndale, Canada’s oldest school of its kind, will retain its current campus, where some 1,200 students study humanities, social sciences, business and theology. Tyndale will take limited possession in the fall, and ready parts of the additional campus for use in September 2007. The agreement allows for an extension of the Catholic School Board lease until the end of the 2009 – 2010 academic year. This acquisition had some unusual real-estate elements. A key negotiator for Tyndale, vice president for advancement Larry Willard, highlighted the unusual spirit. In a press release issued by both organizations, Sister Margaret noted, “In recent years we and our independent advisors have reviewed a number of alternatives surrounding the future of Morrow Park. Key to our decision was the knowledge that Tyndale will continue the use of the property for Christian education and that the Chapel will continue as sacred space.” The acquisition itself was approved by the Vatican. Founded in 1864, Toronto Bible College was only the third of its kind in North America and the first in Canada. In 1968, it merged with the London College of Bible and Missions to become the Ontario Bible College. Tyndale Seminary, a graduate school, followed. Willard agreed. “Tyndale is technically a university college – a status that is en route to gaining full university status. In order to gain that status we will need additional courses. This development is particularly encouraging for Tyndale. As recently as five years ago the school was severely stretched financially. “In the midst of a seminary building program, some pledges didn’t come in,” Mackey recalled. Along with a number of other Christian colleges, Tyndale is applying to join the Association of Universities and Colleges of Canada for accreditation as a full university. A team from the Association will be visiting Tyndale soon. “Christian higher education is becoming mainstream,” concluded Willard.